From the spicy sausages of Slavonia to the seafood from Dalmatia, Croatian food and Croatian cuisine are different from one region to another. For a small country such as Croatia, it is unusual to see such a rich culinary tradition, but geographical position and historical events have left an impact on the country’s cuisine and people in Croatia are very proud of this heritage that they nurture and enjoy it on a daily basis. Naturally, they are happy to show it to the tourists. When you travel through Croatia and have a taste of famous Croatian food, you will see how Italians left their knowledge about pasta, the ancient Greeks have taught people in Dalmatia and Istria how to make wine, the Turks who were expanding their empire have brought sarma (mince meat, pork or beef, rolled in cabbage or vine leaves). A lot of Croatian traditional festivities are directly linked to food, whether it is a religious occasion (like Christmas, Easter or celebrations of the local saints’ day) or a significant moment in someone’s life (like a birth of a child, a baptism, or a wedding). Some of these are private and some public, naturally, but some of these can last for days, for example, Saint Martins’ days or Martinje in Croatian language, which takes place in Slavonia and is celebrated in wine cellars, on family properties after the grapes have been picked and includes a baptism of a young wine, and of course, a lot of delicious Croatian food. 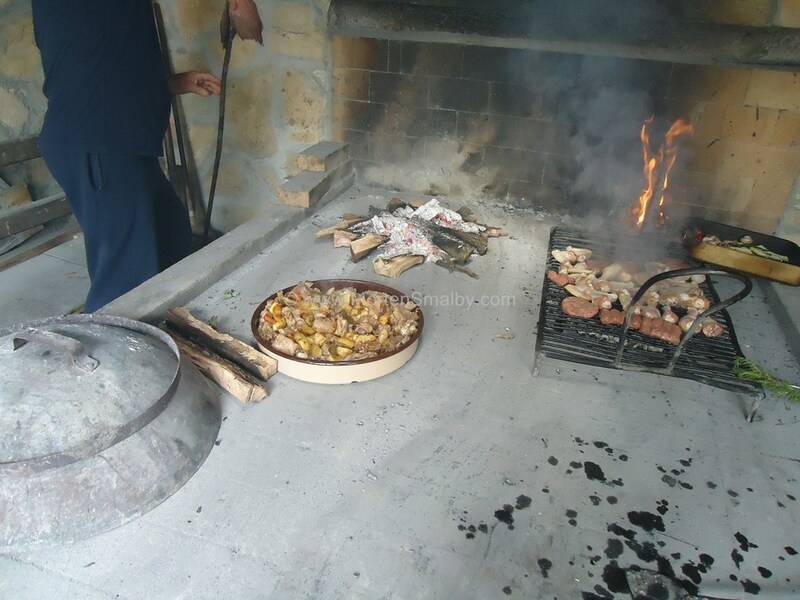 Croatian food prepared in Dalmatia region is specific because of the way the food is prepared. Most of the times they cook their food (in water), sometimes they use a grill or, as they call it the gradele and the famous peka, which is a method of baking. In Dalmatia, the most common food is seafood and vegetables. Dalmatia is rich with Mediterranean herbs like sage, bay leaf, rosemary, basil and olives, which gives their dishes that extra special taste that this regions’ cuisine is known for. 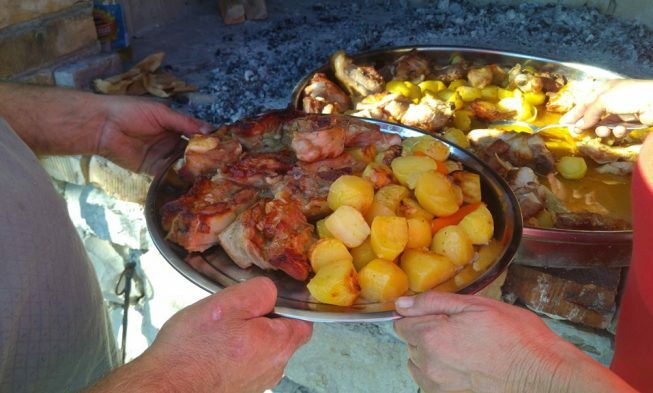 People in Dalmatia prepare all kinds of fish and mollusks dishes and shells, however, they like their meat too – lamb, veal and poultry the most, pork the least. Dalmatian cuisine is basically mediterranean cuisine, and that means that in Dalmatia people use a lot of olive oil, garlic and a lot of herbs and spices. The traditional restaurants that serve Dalmatian food are called konoba, and the majority of konobas serves delicious and quality food. 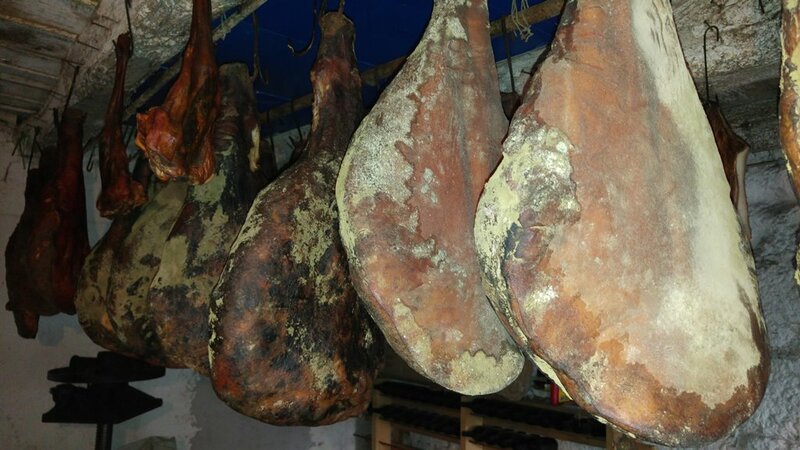 One of the famous dishes is Dalmatian prosciutto (smoked ham). It is usually served with olives and cheese, as an appetizer. Then there is the fish soup. Dalmatians know how to cook it, that’s for sure and whoever tries this always comes back for more. It is rather simple to prepare, all you need is a fresh fish from the Adriatic, some olive oil, garlic, celery, parsley and rice. Another traditional, mouthwatering dish from Dalmatia is brudet , a seafood stew of Dalmatia. It is usually served with palenta – a dish made from boiled cornmeal. The word “palenta” is borrowed from Italian language and palenta is one of Italian heritage in Dalmatia, considering the fact that the Roman Empire ruled this region for a long time in history. To prepare a nice brudet you will need a couple of different kinds of fish and a shellfish. You can also use scampi and crabs. We must not forget to mention the seafood risotto or the black risotto. 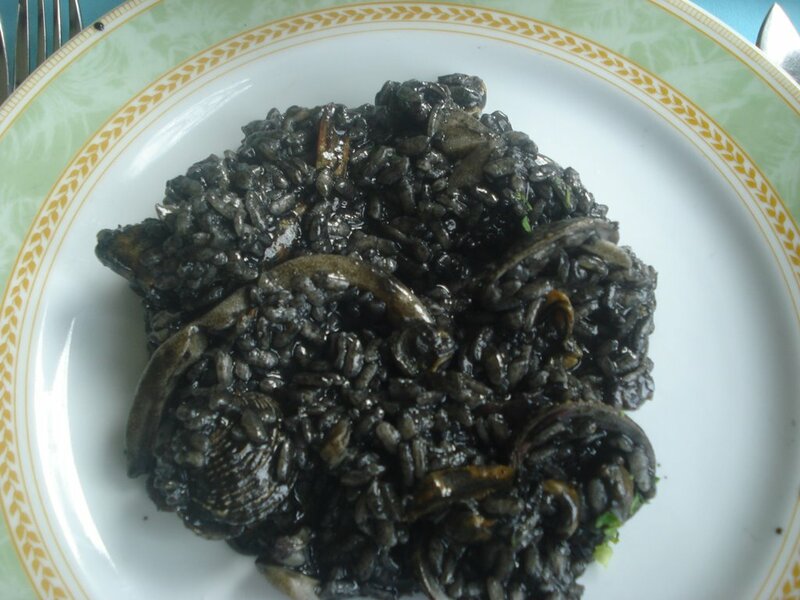 The black risotto is all about the cuttlefish and squid; moreover, what makes it black with such a distinctive taste is the squids’ ink, the stuff which squid uses for protection against predators – once ejected from squid’s body, it gives it the opportunity to escape, as everything around turns black from the ink. People in Dalmatia like to keep it simple, as in life so in cuisine. Because of their simplicity and distinctive taste, these dishes are so easily accepted and have a huge fan base all over the world. One would be surprised to see how easily a fresh fish from the sea prepared on gradele and sprinkled with olive oil and garlic and parsley, could be so unforgettably tasty. Another must-try traditional dish from Dalmatia is pašticada. It is usually served during festive occasions like weddings. It is a meat based dish, usually the beef is used. 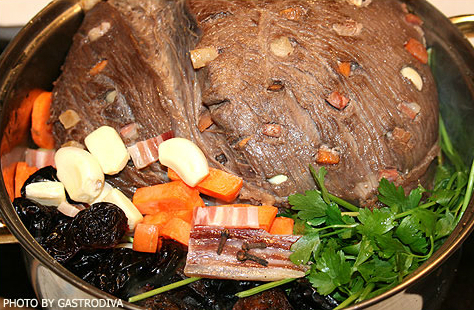 You probably noticed that in Dalmatia people like to accompany festivities with meat. The reason for this lies in a fact that they eat vegetables and fish almost every day (and poultry) and they used to plan ahead when they wanted to eat meat because it required taking a trip to a butchers place and there were not many of them that kept cattle in their back yard, so when the special occasion occurred it was a call for a different kind of meal. Accordingly, it does not surprise that they perceived meat as a special treat when compared to fish that they have every day. Pašticada has a special place in the hearts of people in Dalmatia. The sauce of this dish is very rich with different kinds of herbs and the beef is marinated before the cooking. 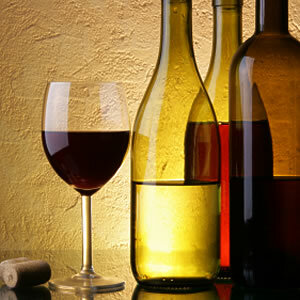 Also, the red wine plays a great part in the richness of the taste. Do not forget to try salted pilchard from Dalmatia. It will require a lot of fine red wine afterwards as the salt will make you rather thirsty. Some of us have a difficult time deciding where in Croatian regions the best Croatian food is. This is rather impossible to say and cannot be answered. 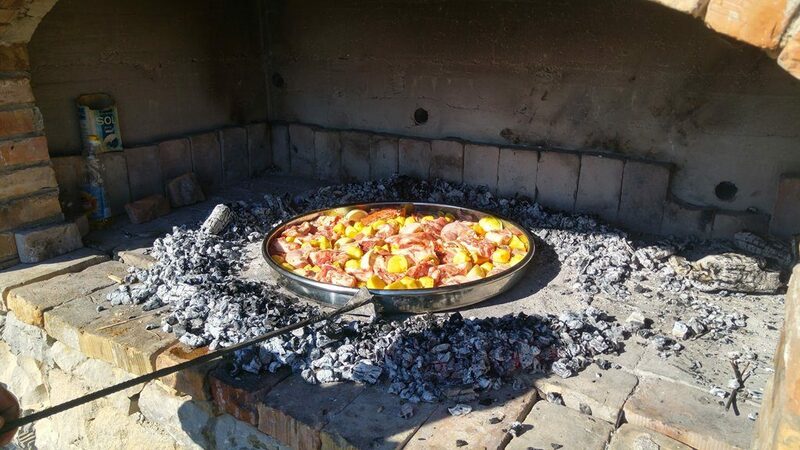 Whoever loved the peka in Dalmatia, will love it in Istria too. The similarities between these two regions, as far as food preparation is concerned, are big considering the fact that Istria is on the same coast by the same sea. However, there is something different here. In terms of cuisine, it represents a blend between the continental and Mediterranean cuisine. Also, Istria is a flat land, with a lot of fertile ground. When Croatian food is mentioned anywhere in the world, Istria stands out as a true gourmands’ paradise. In Istria they love seafood – same as in Dalmatia. They love the peka, as we mentioned, and they use the same spices as Dalmatians do (rosemary, basil, marjoram – to mention a few). They are famous for a couple of things, though. Let’s start with olive oil. There are 1.5 million of olive trees spread on the surface of 2.820 km2 and most of these olive and olive oils are champions that won a lot of golden medals on contests all over the world. It is pretty expensive but the taste of it is worth every penny. Another famous dish in Istria is homemade pasta. There are a couple of sorts – fuži and pljukanci for example are the most famous ones. The magic is in the way people make these and how they cook them afterwards. Just ask when you find yourself in Istria; they will be happy to show it to you over the glass of brandy made of honey – medica. The most famous are fuži in venison sauce and pljukanci in prosciutto sauce, or fuži in truffle sauce and pljukanci with asparagus. You get the picture. Truffles from Istria are a true delicates. There are black and white truffles. This esteemed mushroom (or is it a spice?) is considered to be a gem of gastronomy in Istria. There are stories that truffles are an aphrodisiac, but that is something we will leave for you to discover. Truffles are naturally found in the ground and it is impossible to find them without the help of dogs that are trained for this search. Fertile ground in Istria in combination with the mild climate and in coexistence with other plants; all these combined have made an ideal conditions for these truffles to develop. The big with truffle is the most valued sort. Although in many restaurants in Istria you can taste truffles combined with other dishes, it is a truly amazing gastronomic experience to taste them as a main dish – of course, with fuži. If you want to try shellfish, clams, mussels, shrimp or squid then you need to pay a visit to a Lim Fjord. Beside the impressive and breathtaking view that welcomes you as you approach the Fjord, you will have the opportunity to cheer up your taste buds with some fresh and delicious seafood prepared in buzara style. Buzara is not a dish; it is simply a way of preparing seafood, usually shrimps and shells, which includes white wine, garlic, olive oil and parsley. It is traditional in Dalmatia and Istria. Let’s not forget the Kvarner, as we mentioned it in this section’s headline. Istria, besides being a region, is a peninsula, and Kvarner region is area between Istria and Dalmatia region. What makes this cuisine so adorable is the blend of coast, mountain and islands that altogether provide this place with lavish climate conditions. Of course, there is a difference between the cuisine from the coast and the one from the mountain area. Also, islands that fit into Kvarner region all have their own distinctive ways of cooking and traditional dishes. The scent of sage and lavender will be the first you will notice when on islands of Kvarner, such as Lošinj or Cres. 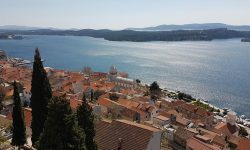 Same as in Istria or Dalmatia, the diet on the coastal area of Kvarner is based on fish, mollusks, mediterranean herbs such as rosemary, laurel, thyme and sage. A lot of vegetables are on plate often, as well as fruits such as fig, grape and lots of nuts, such as almonds. This area has a famous prosciutto that comes from the island of Pag. Pag has one other famous dish and that is the cheese made from goat or sheep milk. Pag is also known for the quality of the lamb. People say that it is because of the wind called bura that blows from the mountain of Velebit and the island of Pag is situated underneath the mountain. So, the bura combined with salt from the Adriatic is the secret ingredient of the prosciutto, the cheese and the lamb from this island. The stories around Croatian food have always been amusing and educational, because through the stories about food one actually learns a lot about the history of this country. As everywhere on the coast of Croatia, peka is famous in these parts also. It’s fascinating how everything turns tastier when you bake it in peka – bread, lamb and octopus are the most talked about and you will hear lots of sighs of pleasure when you mention these to people who have had a taste of it before. If you are looking for traditional desserts from this region, then don’t forget to ask for fig and walnut cake or cake with soft cheese, cherries and chestnut or biscuits with olive oil. The mountain area of this region has a lot of venison, so the visitors who enjoy this kind of meat will be happy to have tried their deer or boar goulash with gnocchi, fuži or palenta. Also, ask for lamb žgvacet with fennel gnocchi. The mountain is a fertile ground for many sorts of mushrooms, which the locals are using in their everyday food preparation. As for dairy products, definitely look for cheese škripavac which is declared as protected cultural heritage. The dominant vegetables in the mountain area are potato and cabbage. Traditional desserts are most of the time made with wild forest fruits, which means a lot of berries is involved – blackberries, raspberries, blueberries, cranberries and wild strawberries – and the freshness of these fruits makes the cakes irresistibly delicious. Not only cakes are made out of these berries but also delicious marmalades, pies and fruit salads. We almost forgot to mention the traditional dessert that this area is known for and which is called paprenjaci. The history of this biscuit goes way back to the times of renaissance. Clove, cinnamon, walnut and nutmeg make a combo that is difficult to resist and which have made this biscuit a souvenir that people take with them when they leave Croatia to remind themselves of the tasty holiday and delicious Croatian food. The cuisine of continental region of Croatia, unlike the cuisine in other regions, the food preparation is under influence of seasons throughout the year. The historical events on the other hand have left their mark too, so here you have dishes that vary from simple dishes that were made for poor people, then dishes that people in the cities prepared and finally the noble dishes that were served to aristocrats. However, they all have one thing in common and that is the nutritional value. The continental cuisine is based on meat dishes (pork, poultry, beef, venison and the freshwater fish). As for vegetables, there are also different than the ones used on the coast. Because long and cold winters ask for more energy, people here eat more of potatoes, kidney beans, string beans, cabbage, onion, and paprika. The region is also known for the usage of plums (which they use for the production of the brandy called šljivovica), apples, pears and apricot. Let’s start with soups, as this region is known for its’ beef soup and chicken soup that are cooked slowly with meat and vegetables and then served with homemade noodles or dumplings seasoned with pepper and parsley. During the winter people here make thicker soups, usually potato soups, or bean and cabbage soup seasoned with paprika and garlic. Everyone in Croatia knows how people from this region love to eat meat; and they really do. They eat all kinds of meat made in so many different ways. However, only a couple of them have become famous though. These recipes are centuries old and people nurture this tradition of making food this way. So, in Međimurje for example, you might encounter a dish called meat from tiblica, which is smoked pork prepared and stored in a wooden barrel. Also, feel free to try beef pržolica which is a beef chop fried and then braised with bacon and seasonings and finally baked with vegetables in the oven. In Zagorje you must try pork fillet stuffed with dry plums in cream and šljivovica sauce. This traditional dish is authentic for this region and no one can make it in such a way as these people can. After all, they have the original recipes and hundreds of years of advantage in mastering the preparation. Zagorje is famous for its turkey with mlinci also. What is mlinci, you might ask. Well, you might call it baked noodle, as someone said somewhere on the Internet. It is difficult to explain exactly, however, mlinci is side dish, thin flatbread that resembles a noodle and a cracker at the same time. You can buy them already baked, but it is more fun to make them on your own, as it is very simple dish to make. You need flour, some salt and water and eggs if you prefer, or fat. When served with turkey for example, mlinci is usually broken up into pieces and then poured over with hot water or soup or the juice that came out when you were baking your turkey. Paprikaš is another traditional meal – the one that we inherited from Hungarians. It is a paprika-based stew with meat, potato, paprika, peppers and bacon or spicy sausage, like the Debrecener sausage. In Slavonia and Baranja they prepare the famous fish-paprikaš, which is a freshwater fish (catfish and carp) stew. They also make a venison paprikaš. This region loves to make aspic too, and they use all kinds of meat, so if you like this dish, try it. Like other Croatian food, we are sure it will not leave you disappointed. Furthermore, if you want to try some geese and ducks made in all kind of traditional sauces then pay a visit to Turopolje and Posavina as they are the ones known for these recipes. In case you were wondering how did the food for poor look and taste like, then look for a dessert called zlijevka or zlijevanka. It is a simple recipe and a tasty cake comes out of it. If you visit one of the many family owned restaurants, ask the chef for it, if you are lucky you might get your hands on this simple-to-use biscuit that you can bake at your house and boast in front of your friends about it. After all, how often can you say that you have made a dish following a recipe that is a couple of years old? In addition, people from this area have adapted many of these recipes to make ancient dishes adjusted to modern taste expectations. So, if you are interested in these, then ask for balzamača. The basis for these cakes is eggs, corn flour and cheese. Slavonia is best known for kulen. This is very famous sausage and as far as Croatian food is concerned, one of the most famous Croatian dishes. It is traditionally produced in Croatia and basically it is a spicy-flavored sausage made of pork meat. Its cultural heritage is protected. The color of this sausage is red, because of paprika in it which also gives it a distinctive flavor. It is a dry, smoked sausage that is usually prepared in autumn so it could be enjoyed during the winter. It looks like people in Slavonia like to make stews, because there is another famous one called čobanac. Actually, it is a shepherd’s stew that people from this area call čobanac, and it is another traditional dish originating from the continental region of Croatia. The best taste of it is achieved when it is prepared in a large cast iron or stainless steel pot outdoors over an open fire. Back in the old days, people used to prepare it on fireplaces inside the house. They like to cook it for different kinds of festivities that include a large number of people. Over the country people have made variations of the original recipe, depending of the region, however, they all call it the same – čobanac. Čevapčići or Ćevapi, which is not originally Croatian food, have been in Croatia long enough to become traditional dish. They are a national dish of Bosnia and Herzegovina, a legacy from Turks while they were residents of Ottoman Empire. Čevapčići are made of minced beef meat and formed with a funnel. They can be made of both pork and beef meat also. One serving usually comes in 5 to 10 pieces accompanied with lepinja or somun, which is a type of bread. You can have it with kajmak and with onion, which is pretty tasty altogether. Kajmak is a creamy dairy product. Believe it or not, but people in this region actually do eat salads. They make them with white or red cabbage, tomatoe, paprika, onion and all kinds of green salads seasoned with salt, vinegar and oil. They also make extremly delicious kidney bean and potato salad with pumpkin seed oil. They also store a lot of vegetables for the winter period, most usually pickles, cabbage, paprikas stuffed with cabbage for example. As for desserts, a must try is orehnjača – a nut roll. Yes, it is a roll and yes, it has a walnut filling inside. We have tried it and we have enjoyed it. They also make a very delicious poppy seed rolls. Actually, these people like to make a lot of cookies and cakes and rolls and strudles and pies and who knows what, so feel free to ask them, the range is pretty impressive. 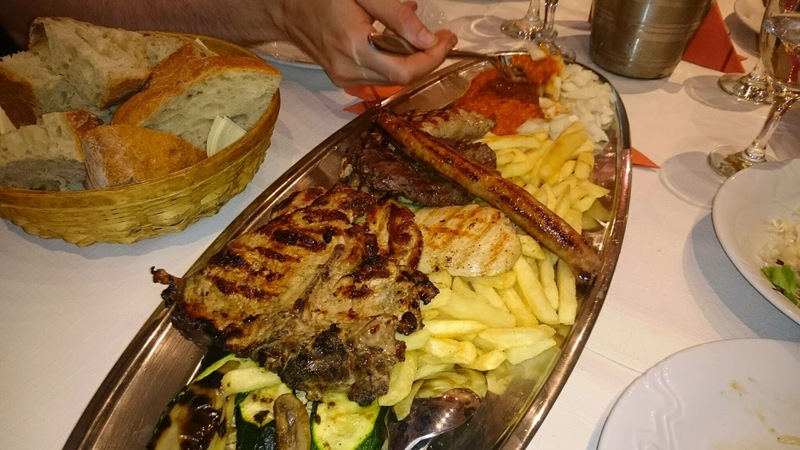 One last thing – if you find yourself in Zagreb, make sure you try Zagrebački and Samoborski steak. And whatever Croatian food it is that you will be enjoying, try to do it with a glass of fine Croatian wine for the complete experience.